SHHHH…. it's not really a lazy Sunday… but no one has to know. Go ahead, Prop up your pillows, sip your coffee, and have your Sunday paper nearby, you're just a few short clicks away from having all your errands complete all from the comfort of your favorite comforter! It might just be the most productive day you've had all week, and you actually only have to lift a finger. It's the weekend! And for many, it's the time to get your personal errands done. If, like me, you live in a big city the traffic can almost be worse on the weekends. It's when EVERYONE has time to run their errands. I live in Los Angeles and driving on a Saturday is equal to a personal tour through hell. It's time to utilize this changing world and let the growing tech world work for you. We've collected our favorite apps for every thing you may need, use them all, use only one. Either way, this is your intro to life hacks to let you be lazy without anyone being the wiser. Most grocery stores have delivery these days. What we love about INSTACART is the personal shopper aspect. If you order from one of the big stores and they are out of your item it just doesn't show up. With Instacart, you get a call from your shopper letting you know they are out of your brand and to inquire if you’d like to replace it with another or skip it! I love being an amazon prime member, free shipping and sometimes next or even same day delivery. But did you know that Prime NOW has their own app and will have your items to you that same day, if not within the hour! And we're not just talking necessities. Last minute trip? Need a new suitcase? Done. Delivered in 2 hours. Their tag: The best of your city delivered in minutes! It's exactly what you think it might be. An Uber driver picks up your food at your favorite restaurant and drives it to you! Almost seems the "classic" now with all the new food delivery services. But classicas are sometimes the best! Need a hand moving a heavy piece of Furniture? or putting together that Ikea bookcase? Need a handyman for an hour or two? Don't use a housekeeper but would really like a one time cleaning job? Need a painter to help you patch that wall you've been glaring at for weeks? Don't feel like picking up your dry cleaning? Wouldn’t it be nice to simply hire a personal assistant for the day? Any "task" you need! Done Done and done! "Taskers" are fully vetted and rated. 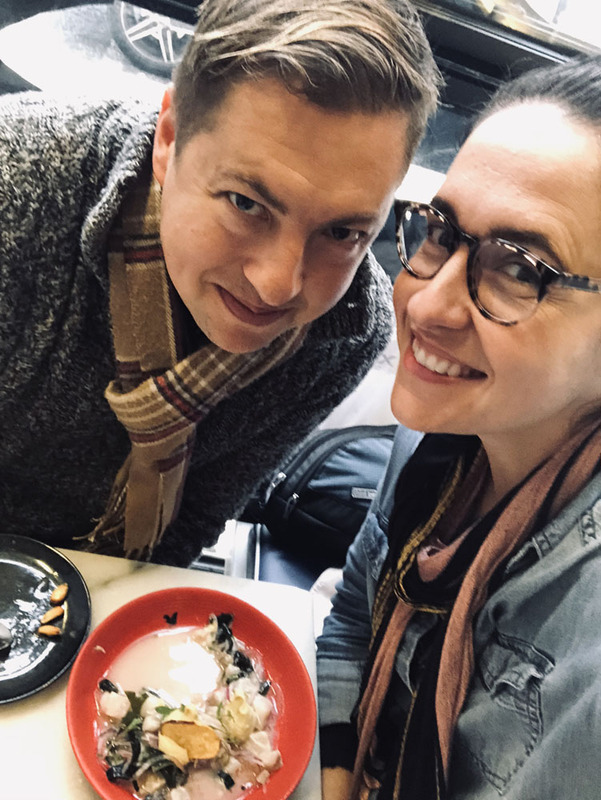 I’ve never really given much thought to that hotel staff member sitting quietly at the desk in the corner of the lobby, that was until my husband was suffering some major food poisoning on our layover in Paris, via Morocco. I was worried that I might need to bring him to a local hospital but the wifi wasn’t working and I had no idea where to begin (I’m of an age to remember what it was like traveling before the Internet and we simply just deferred to old-fashioned human interaction!). So, I headed for the concierge desk and–voila!–all of my questions were answered, my mind and heart soothed. Sometimes, it’s just really nice to speak to a human, rather than poke around in a travel app. This experience got me thinking that most travelers are most likely seriously under utilizing this resource. 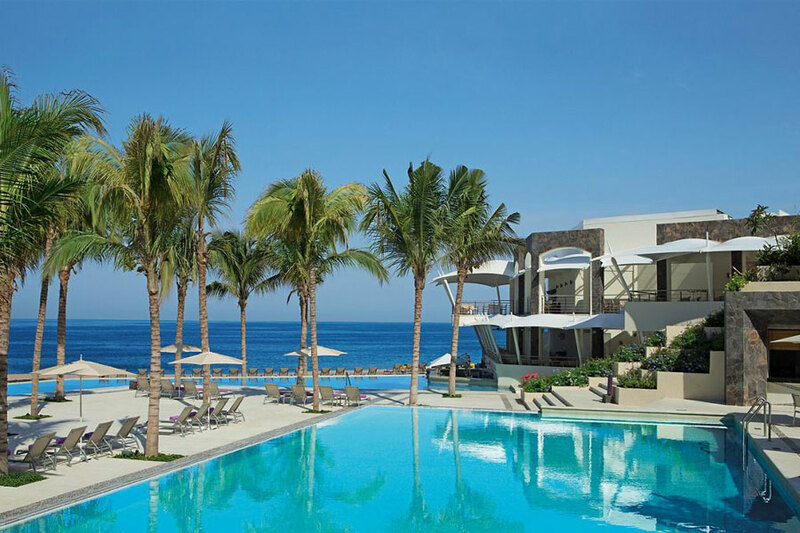 Below are some creative problems that your friendly hotel concierge might just be the answer to. Book pre-arrival activities that could be sold out before you get to your destination (sporting events, shows, private tours, restaurants, etc.). Recommend nearby fitness facilities/gyms (and may even be able to provide free day passes!). Help to make an appointment at an embassy or arrange for passport expediting. Need a babysitter? Your concierge can probably help with that (or a petsitter for that matter!). Meet and greet: arrange for friends or family members to be met at the airport. Need a last-minute haircut? Yep! Have your rental car delivered to your hotel. Suggest a few out of the way local restaurants or ethnic cuisine options. Save time: yes, you certainly can look up things/activities/questions on your own, make phone calls and send emails, but often it can be easier to delegate these time-consuming tasks to someone else (hey, you’re on vacation!). Competitive pricing: Concierges are usually locals and can often secure better prices. P.S. Pro Tip–you don’t necessarily need to be a guest of the hotel to consult with the Concierge. If they’re not busy, they are usually very willing to offer a bit of advice! P.P.S. Depending on the level of service, gratuity/tip is always a good idea. I’m calling this adventure, “when you can’t get enough of a good thing”, as it was actually our second trip to Portugal in just 5 months! 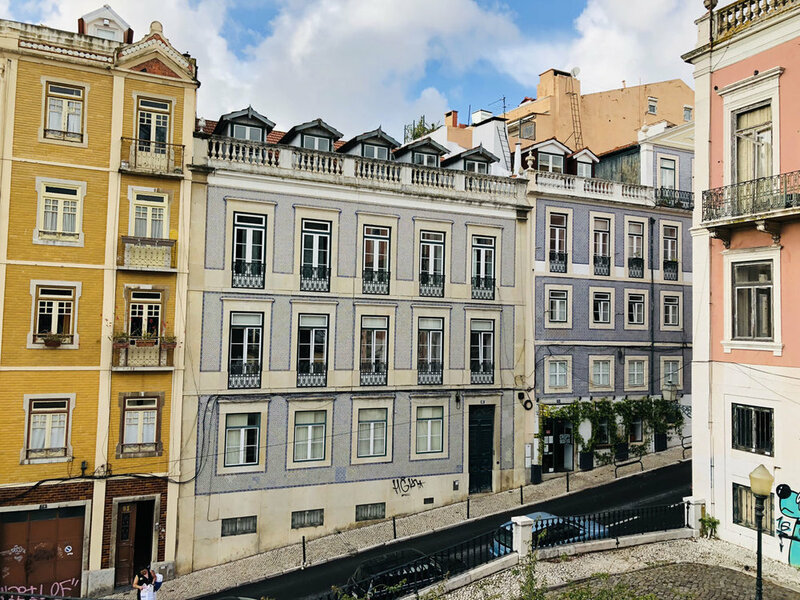 (we visited for a 2-day Lisbon layover in June of 2018 and immediately decided that we needed to return as soon as possible–and we made it back in October!). 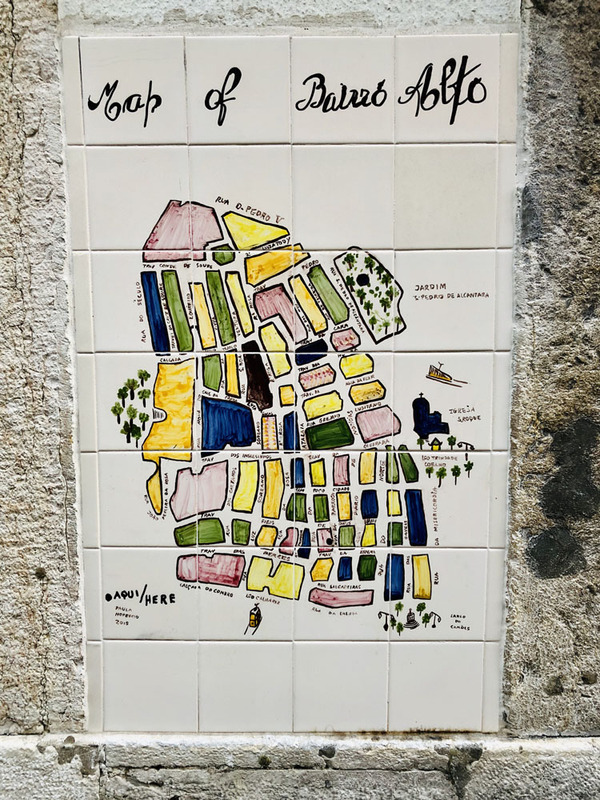 Lisboa is more than I ever could have imagined; the cozy streets with stunning b&w mosaic cobblestones and each building with its unique and colorful tiles, thrusted us back in time. And believing that you are the first to discover the exquisite food (fresh SARDINES!) and bright wine (hello, Vinho Verde) is rare feeling. With delicate pastries and a cafe/bar culture to rival Paris–plus centuries of cultural influence from around the world–it’s a place unlike any other we’ve been in Europe. There are also a ton of lovely day trips to easily be had via train (ahem, Belém). 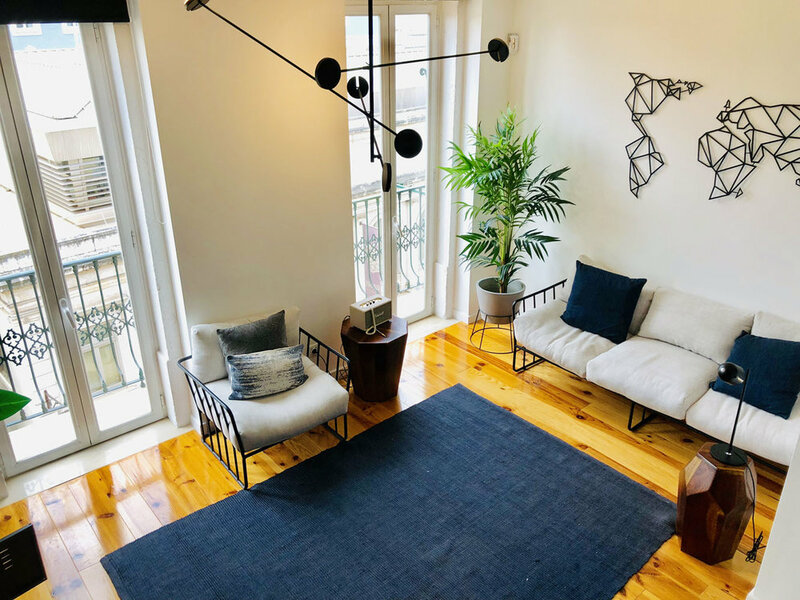 We stayed in the central area of the city, the Cais do Sodre district, and lucked out with this amazing Airbnb apartment. 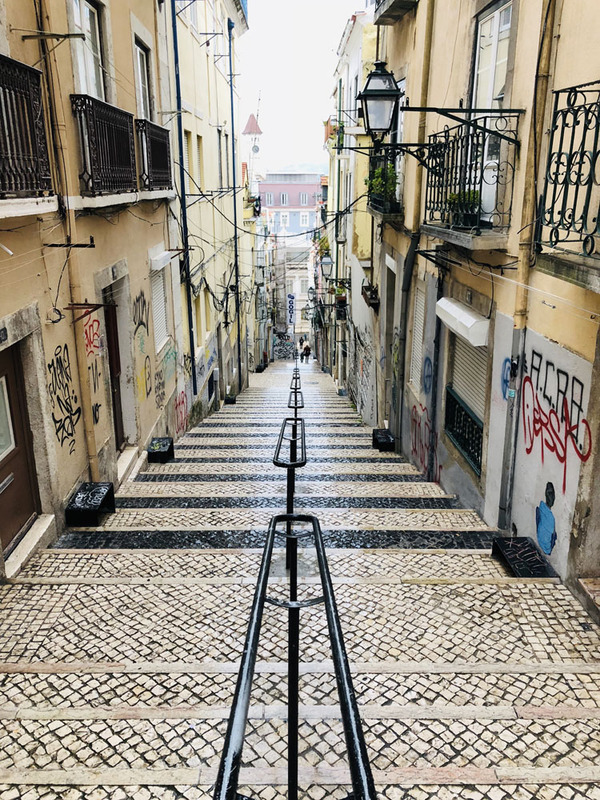 It certainly helped that our place was at the bottom of the hill (let’s just say that Lisboa and its stair system is not for the faint of heart… keep in mind that it’s much easier to walk down the hill at the end of a long day!). The Lisboa Time Out Market is a great place to start. 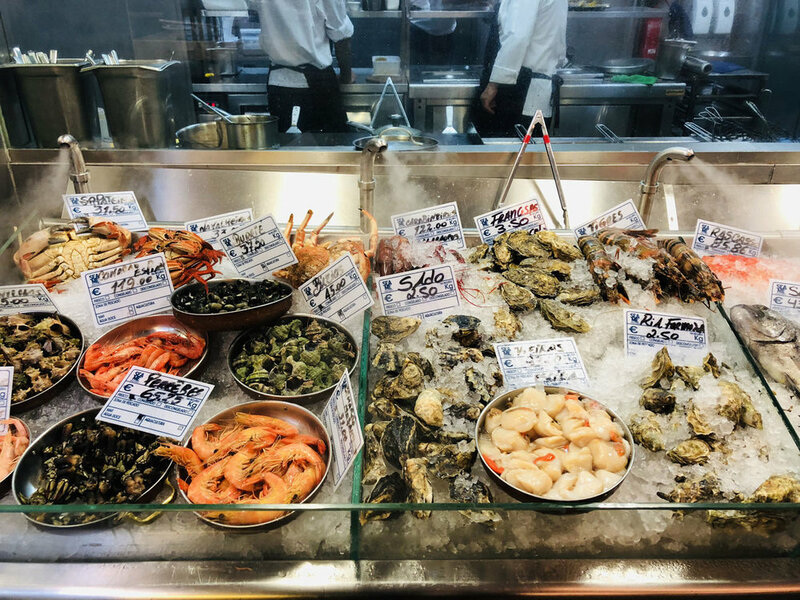 It’s a gorgeously designed interior market space that houses local produce and fish vendors, as well as miniature versions of some of the best restaurants in the city. Begin here and familiarize yourself with a few treats, meats and local flavor. 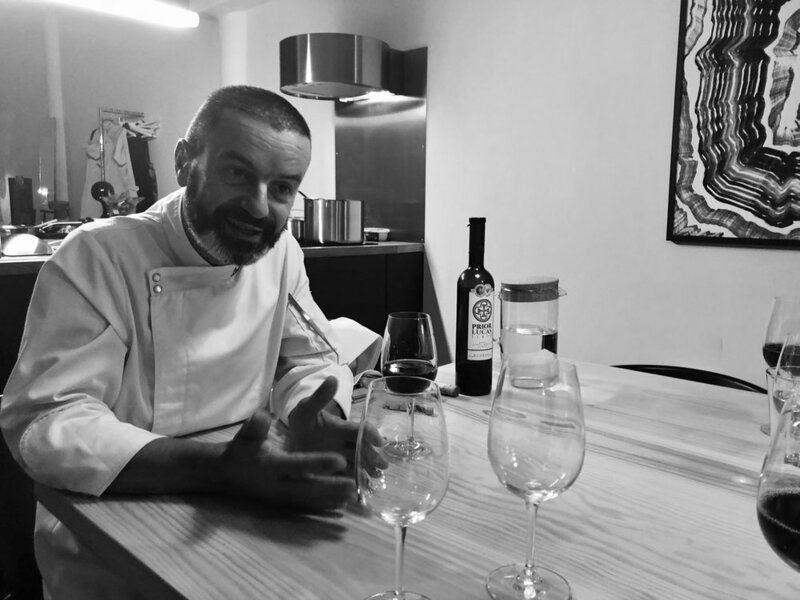 Speaking of food, we also booked one of our very first Airbnb “experiences”, Eat and Drink as the Portuguese, with Chef Luis Castelo (@oficinaoito). 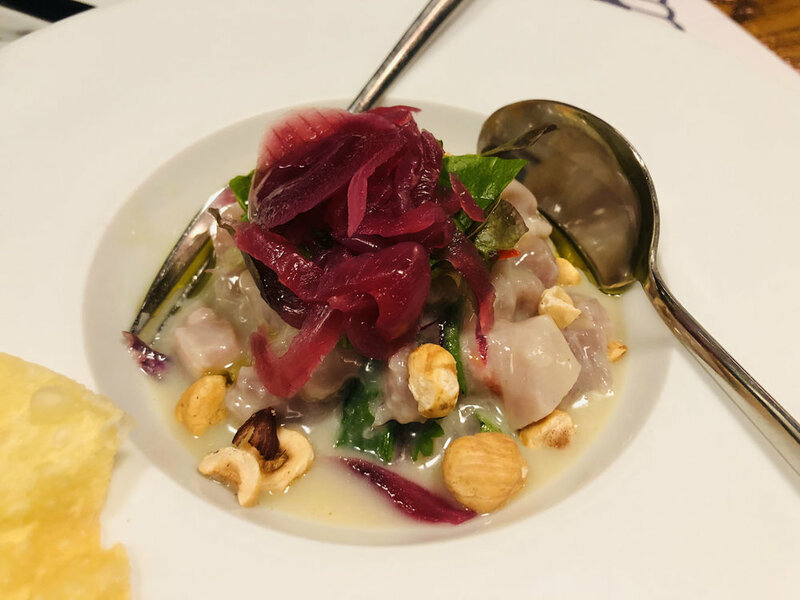 It was a delicious 4-course seafood dinner with wine pairings and it turned out to be a great way to get our barrings on the culture and food from a local host. *In general, we think that any opportunity do something with a local (a dinner, town tour, learn a craft, etc.) should be snapped-up! With that, here’s a bit more of what we did (please keep in mind that it rained the entirety of our trip, so we mostly just ate and drank!). Manteigaria: our very favorite place to eat the traditional pasteis de nata (trust me… we indulged at every single bakery we could find!). And this particular bakery won every time. Café Janis: tiny restaurant with a great sidewalk cafe and excellent breakfast options (but more in the French style). SEA ME Peixaria Moderna: This small chain acts a fishmonger/restaurant; it was a fun experience and I had my first-ever fresh/grilled sardine (spoiler alert: it was glorious). LX Factory: for boutique shopping and eats… a super cool, fully restored thread and fabric factory, full of quirky stores and restaurants (a quick, 10-minute train ride from city center). 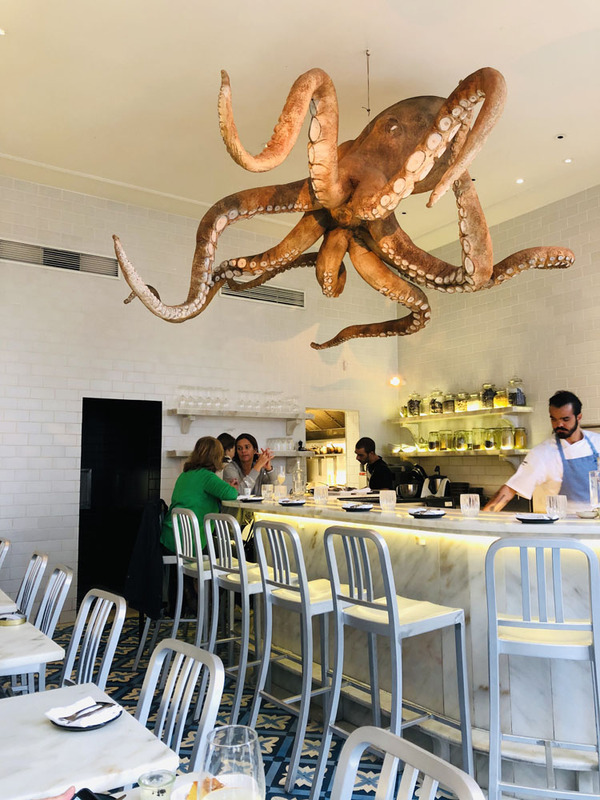 Restaurante A Praça (at LX Factory): our fav for eats in this area–we had a delicious octopus lunch in their funky, antique warehouse space. A Cevicheria: stop here for fresh/fancy/yummy ceviche! (and to see the giant octopus hanging from the ceiling). The Wine Cellar: a great spot to grab a quick glass of wine and chat with your friendly host (ours was the very entertaining, Jezza!). Boutique Tarberna: in the Alfama area and the very best hidden gem in the city, this tiny bar has lovely live music and the patrons spill out onto the steps to enjoy the ambiance. A MUST DO. By the Wine: a cool interior worth checking out; sit at the bar and enjoy a glass of their own wine and snack on one of their cheese/meat plates. Carmo Archaeological Museum: worth taking an hour or so of your day to check out this interesting museum (a super old church without a roof! ), giving you historical context and providing a fun photo spot. Castelo de S. Jorge: it’s quite the uphill hike to make it to this castle, but you’ll be happy you did. It boasts stunning views of the entire city and is an important piece of the history. The Bertrand Bookstore: the oldest bookstore in the world (1732) and originally the hub of the intellectual scene, it now has a nice cafe and it’s quite a fun experience to dive into each consecutive, arched room of books. PARK Bar: get here early and park yourself (pun intended) for sunset at this roof-top/garden terrace bar, literally located above a parking garage (it’s tricky to find the elevator for entrance, but totally worth it when you do!). Order a bottle of wine and plan to stay for a couple of hours. 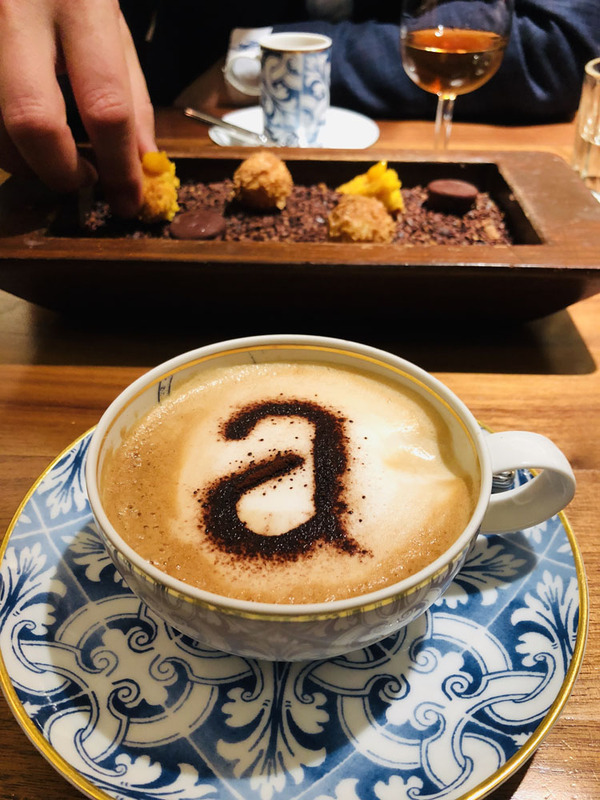 I’m also calling this trip “the gluttonous period never to be forgotten” because we may have gone slightly overboard with more than a few Michelin-Star restaurant visits (but hey, we didn’t know if we’d be back!). 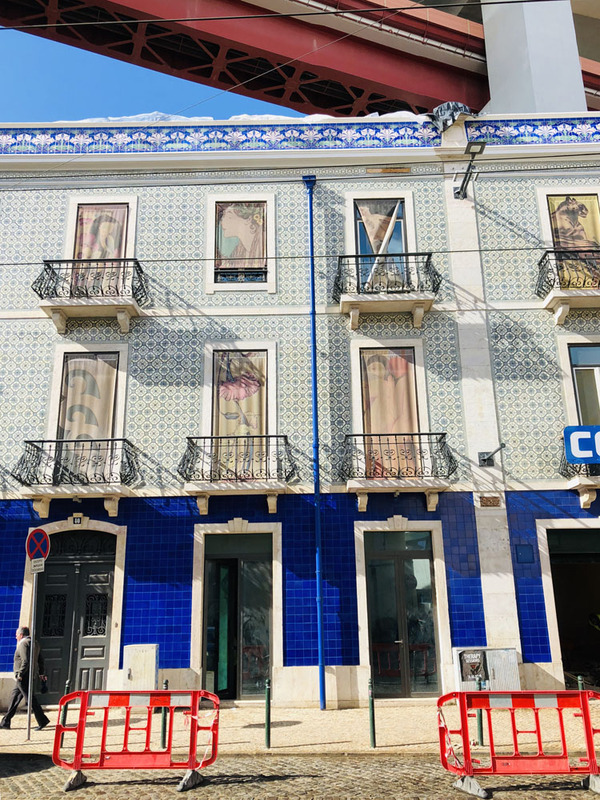 Loco: if you get a chance to book a table at this restaurant (loco meaning “local”), you will be delighted by every distinct taste and texture of Portugal. 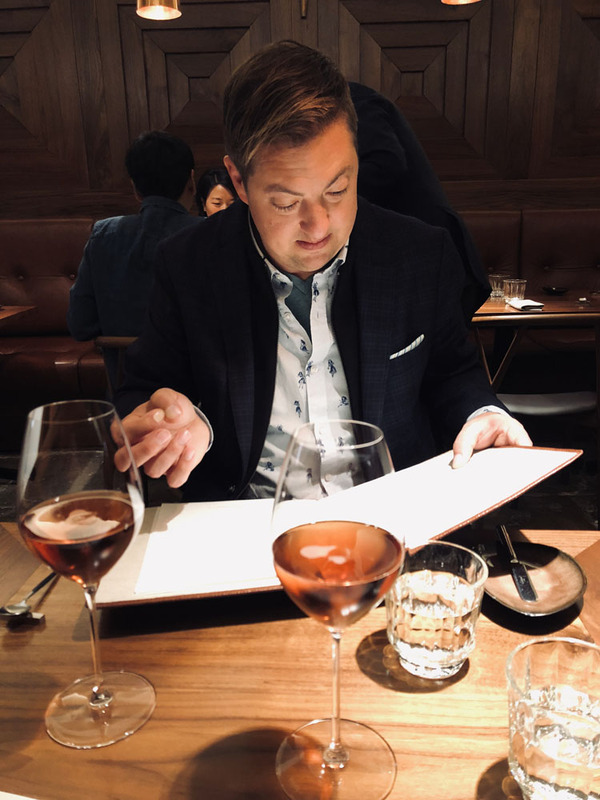 Their dance of rich ingredients, lovely wine pairings, the very kindest service, ingenuity with subtle flavors and a few surprise elements, was out-of-this-world. The horse mackerel, to die for (FYI, you must book online months in advance). ALMA: meaning “soul” and fully living up to its name. We lunched here and got our faces blown off by the presentation and complex tastes (I can only imagine what a dinner holds!). Foie gras perfection, seaweed and cockles, vegetables fried in squid ink batter, and the very best meat (beef tenderloin) that I had in the entire country, plus marvelous wine suggestions from the award-winning Sommelier, Nelson (FYI, you must book online months in advance). Mini Bar by José Avillez: a fun, almost theatrical experience, it’s worth stopping in to have a drink at the bar and enjoy one of their yummy appetizers (nothing is quite what it seems!). Wear smart shoes. No, seriously. Those cobblestones are very slippery and you’re definitely going to get a leg workout. Simply enjoy wandering the small (but steep!) 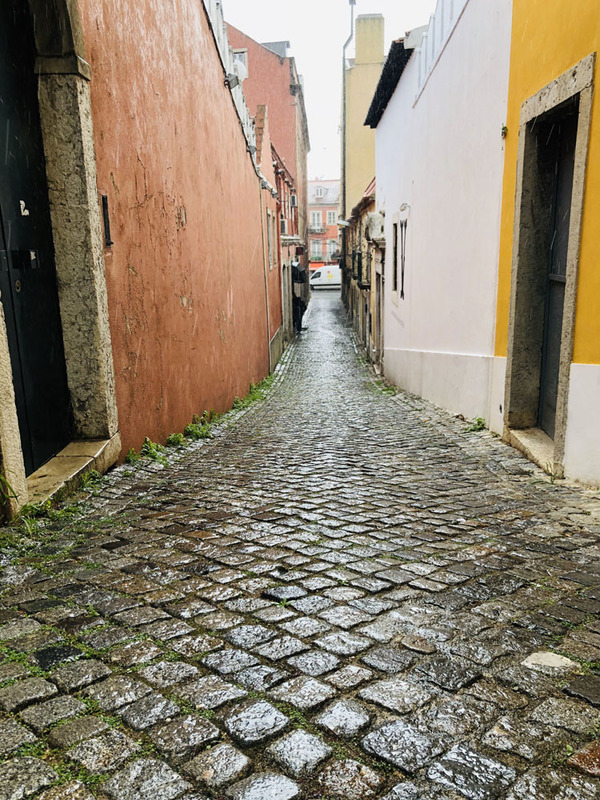 streets of the colorful Bairro Alto and similar neighborhoods, without any agenda. If you visit Belém, or the Pena Palace in Sintra, do be sure to start your journey VERY early in the morning (otherwise, prepare yourself for multiple hours of waiting in line!). Watch out for pick-pockets in the super touristy areas (but, duh). Embrace the tricky language! We found the Portuguese people to be very open and happy to help us learn a few new phrases. P.S. I can’t end this post without talking about something truly strange and magical that we accidentally stepped into… Chapito e Mesa. Believe it or not, it is a full-fledged CIRCUS boarding school! 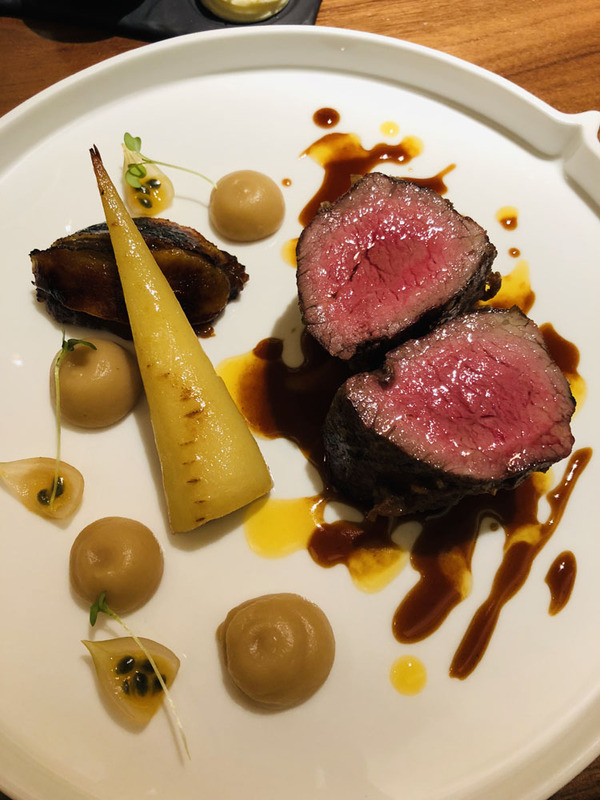 You’re not necessarily going to visit here for the food (although the view from the restaurant is stunning and the service is great), but rather for the overall experience of it AND to support their artistic way of life–from the general ambiance to the table-side magic show, you won’t be disappointed. And to top it all off, at the end of our meal we wandered down to the very basement level to find a wild, impromptu live music show in progress! Enjoy some fun images here by me, Bernadette (bernadettephoto.com/ @dettesnaps). Every year, without fail—and with the first drizzle of Spring—I look out the window and think to myself "Dammit, I don't have a rain coat!". Well, NO MORE. This season, I'm determined to add one functional, yet striking, outerwear piece to my wardrobe (even if I only wear it once). With that, I've had fun scouring the interwebs for unique jackets, but also quickly realizing that I might just *need* two options, depending on my mood. So, here are some of my picks for both playful and classic days... and, oh yeah, these won't break the bank. 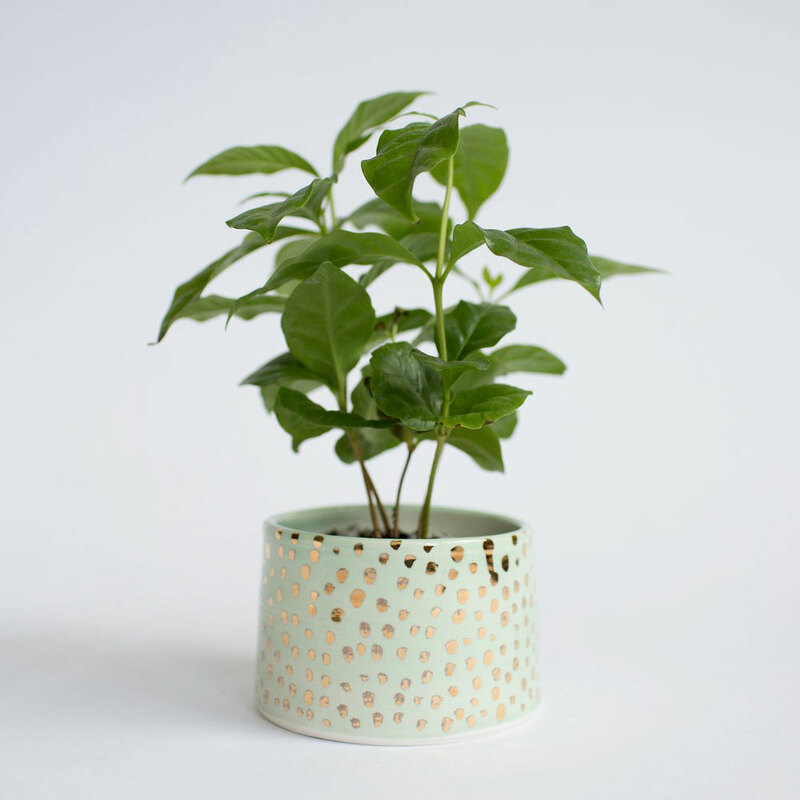 We're infatuated with Minneapolis-based clay artist Louisa Podlich of A MANO. 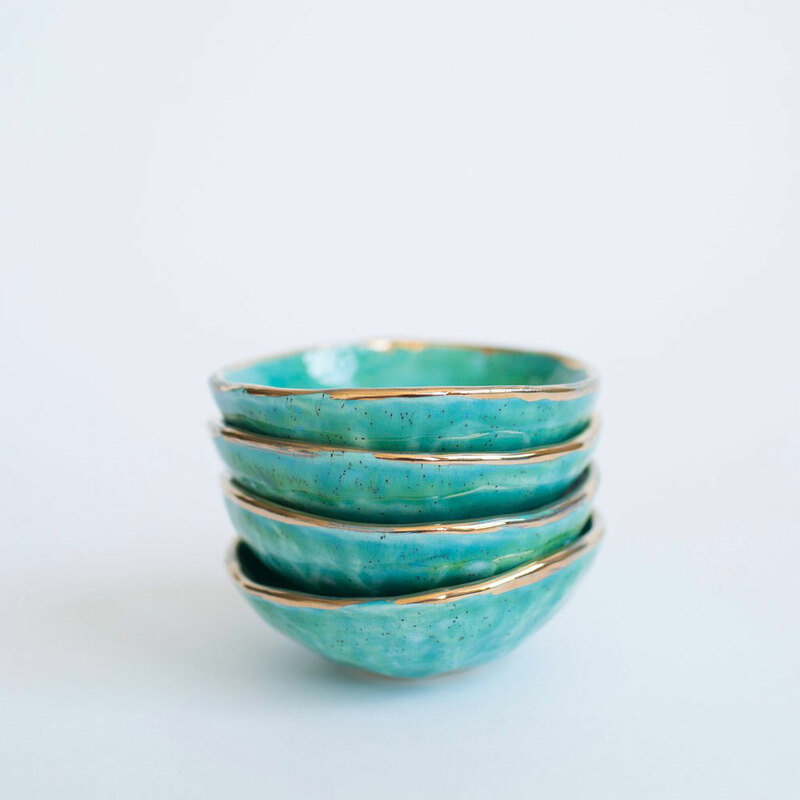 She crafts the most delicate and whimsical designs, with an eye for pattern, color and unique glazes. 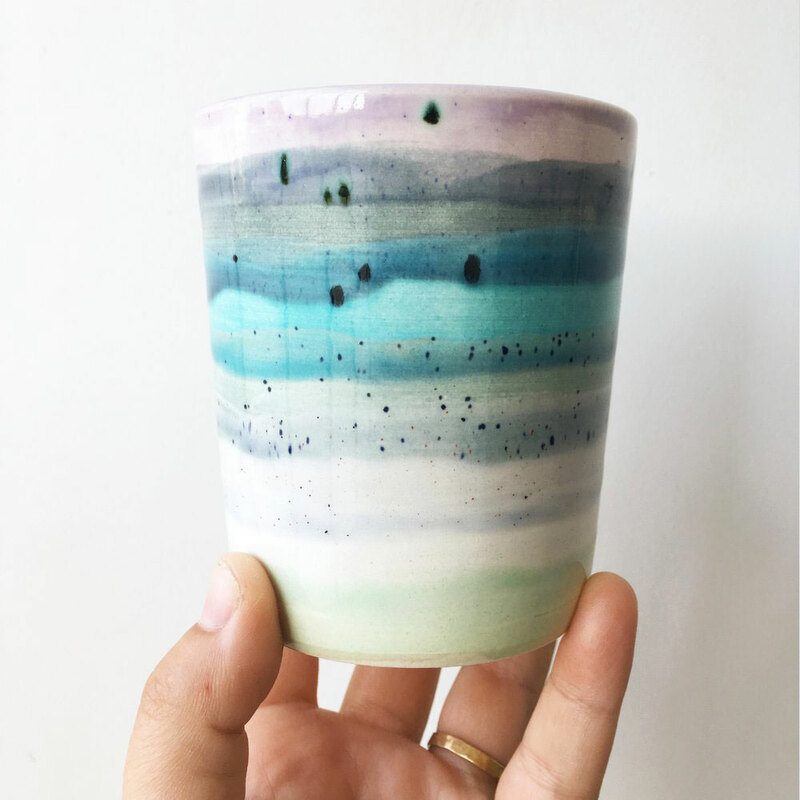 From practicals like her petite bowls for keepsakes and jewelry, to her fun confetti-inspired workbench tumblers (our fav), to the not-so-practical but totally amazing "Spirit Rocks" -- we simply can't get enough of her own spirit in this work. *Images courtesy of A Mano. I just experienced my very first, full-on flu. In the past, I believe that I've often said "Ugh, I've got the flu! This is awful!" when I actually just felt a bit feverish. But then... I got... THE flu and soon realized that I had absolutely no idea what I was talking about before. So, in the spirit of saving others from the pain and suffering of any serious yuckiness this season, I've gathered a few tips for avoiding potential germ attacks for the remainder of winter. If you can do your best to get at least 8 hours of sleep each night (I know, I know... this is a big ask), it will hugely help support your overall immune system function during the winter. I think my grandmother got it right -- whenever she felt even the smallest twinge of sickness coming on, her number one rule was to immediately stop everything and simply rest. The power of a good night's sleep should never be underestimated. And here's some interesting info to help determine if you're getting enough. Try not to touch your face. It's seems basic enough, but you'd be amazed how much we mess with our noggins throughout the day. Resist the urge to fuss with your eyes, nose and mouth. It's the most common way for germs enter your system. For kicks, watch this video to learn how to wash your hands like a doctor! We swear by a lemon-ginger-honey-tumeric-cinnamon-cayenne concoction (recipe: Morning Detox Tea >> Into The Gloss). It's actually super yummy and comforting in the AM, combining spice and heat for anti-inflammatory and metabolism boosters. 18-Immune Boosting Recipes >> Brit + Co. Even if you choose to focus on improving just 1 of the above, you'll likely be the better for it. Cheers to staying healthy this season! *Photo by Jilbert Ebrahimi on Unsplash. I can't even remember how we first discovered our favorite restaurant in Paris. I do know that it was 2014, and Anna and I both happened to be in Europe at the same time. It was perfect timing for her to fly from Germany to France to meet up with me. 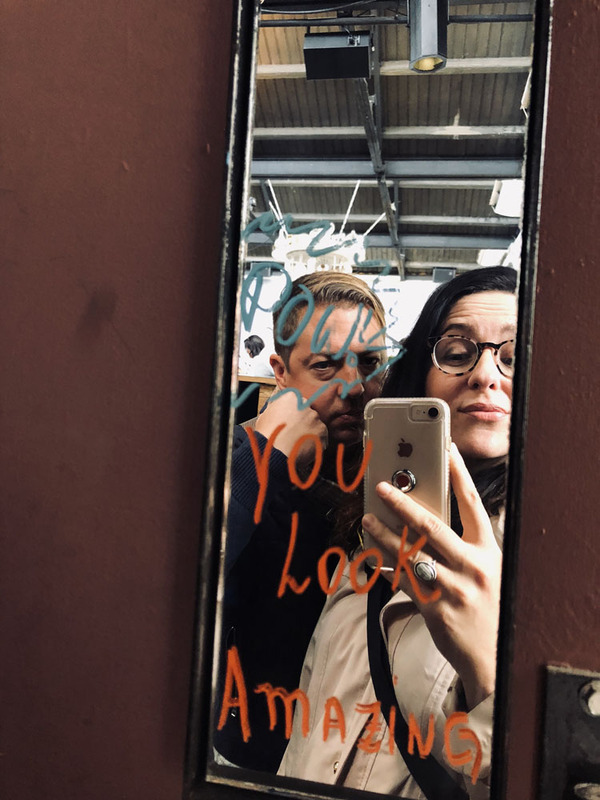 Paris is one of my most cherished cities and I was looking forward to being with Anna as she experienced it for the very first time! But, after multiple flight delays, sadly we were left with only 1 night in the city. And at 10pm that evening, all we really wanted was to find was an authentic, cozy dinner spot to enjoy a glass of rosé and a good meal with the locals. As I would imagine being drugged and kidnapped feels like, the next thing I remembered was wandering down a small alley, nearly starving to death and just praying that there was a snack at the end of the ordeal. And then, like a guardian angel, a man appeared under a street lamp in front of a tiny, unassuming establishment. As soon as the handsome young Parisian offered us an aperitif on "La Terrasse" (i.e. having a drink in the alley), we knew we had found our place.